Welcome to FMEP’s Weekly Settlement Report, covering everything you need to know about Israeli settlement activity this week. To subscribe to this report, please click here. The Israeli Interior Ministry announced its plan to deposit the Jerusalem cable car plan for public review on February 1st, which will mark the beginning of a 60-day public commenting period. At the close of the public commenting period (appx. April 1st), the National Infrastructure Committee (NIC) will consider objections submitted against the plan as part of the process of granting it final approval. As FMEP has previously covered, the Jerusalem cable car project is an initiative of the Elad settler organization (which is building a massive tourism center – the Kedem Center – in the Silwan neighborhood, which will be a stop along the cable car’s route). The cable car project is intended to further entrench settler activities and tourism sites inside the Silwan neighborhood of East Jerusalem while simultaneously delegitimizing, dispossessing, and erasing the Palestinian presence there. The NIC is a body within the Finance Ministry that fast-tracks projects deemed a national priority, circumventing the scrutiny and delays that are part of the normal planning processes for non-priority plans. 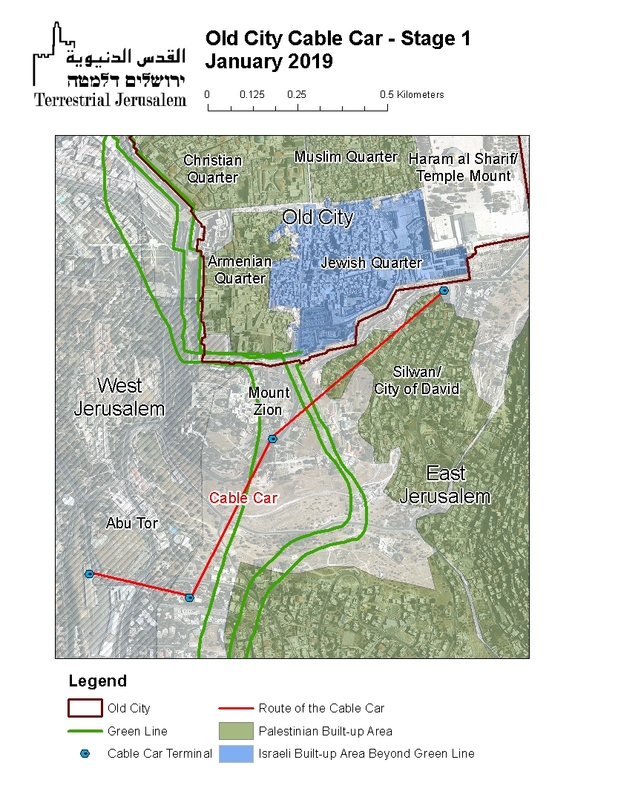 In order to justify the cable car line, the Israeli government has advanced the project as a public transportation “solution” to address traffic congestion in and around the Old City and to serve the needs of everyday residents of Jerusalem (the government actually changed a law in order to give the NIC jurisdiction over its planning process). The government has so far refused to release an internal economic feasibility report supposedly backing up that claim. Israeli experts counter that the plan manifestly has nothing to do with the transportation needs of the city and its residents. Non-governmental groups like Emek Shaveh, Who Profits, and Terrestrial Jerusalem have repeatedly discredited the government’s line, and have clearly enumerated the obvious political drivers behind the plan, the archeological heresies it validates, and the severe impacts the cable car project will have on Palestinian residents of Silwan if implemented. Hitting the campaign trail, Prime Minister Benjamin Netanyahu promised that Israel will never evacuate settlements or outposts again. His promise was notable not only for its content, but also for when and where he delivered it: during a meeting with settlers as part of a high-profile visit to the site of an illegal outpost. The outpost in question, Netiv Ha’avot, was the center of a lengthy battle which culminated in the Israeli government evicting settlers from a number structures, after the Israeli High Court ruled the structures were built on land privately owned by Palestinians. Addressing the settlers (ones living in structures also built illegally, but permitted to remain in place since the land on which they were built is not recognized by Israel as privately owned by Palestinians), Netanyahu called the court-ordered evacuation and demolitions in the outpost as a “mishap” that would not happen again. Netanyahu went on to say. Indeed – Israeli lawmakers are working assiduously to prevent any future court-ordered evacuations of outposts and illegal settlement structures, as FMEP details in its comprehensive tracking of such moves. The Israeli cabinet recently endorsed a bill that gives the government 2 years to retroactively legalize 66 outposts across the West Bank, including Netiv Ha’avot. The bill also directs the government to immediately begin treating those outposts as if they are legal, meaning that if the bill becomes law, the illegal outposts will be connected to Israel water and electricity grids, receive municipal services, and receive government-approved and government-funded budgets. The bill also allows the finance minister to guarantee mortgages in the outposts. The Israeli government is also planning to retroactively legalize and expand the Netiv Ha’avot outpost – proving once again that Israel not only doesn’t punish settler law-breaking, it rewards it. FMEP has previously covered how the Israeli government has exploited the evacuation of settlers from 15 homes in the Netiv Ha’avot outpost as an opportunity not only to advance construction in another settlement (Elazar), but also to build an entirely new outpost as “temporary” housing for the settlers. The “temporary” outpost – where 15 mobile homes have been placed and are connected to Israeli water, power, sewage, roads, and other infrastructure – is located outside the borders of the Alon Shvut settlement. That fact did not stop the High Planning Council (a body within the Israeli Civil Administration, which regulates planning and building in the West Bank) from approving the plan, noting that “the plan is improper, but we will have to approve it as a temporary solution.” As part of its approval of the plan, the Council ordered the government to take steps towards expanding the borders of the Alon Shvut settlement to include the outpost, underscoring the meaninglessness of the word “temporary” in this context. On January 28th, Prime Minister Netanyahu announced that he will not renew the mandate allowing the Temporary International Presence in Hebron (TIPH) to continue to operate. The TIPH has been observing and documenting incidents between Palestinians, settlers, and the Israeli army in Hebron since 1997 – when Netanyahu (who was then in his first stint as Prime Minister) signed the Hebron Protocols which laid out arrangements for a divided Hebron. Many Israeli lawmakers, including Netanyahu, have levied heavy criticism against the TIPH over the past year, particularly after an internal TIPH report was leaked in December 2018 that detailed Israel’s “severe and regular” breaches of international law in Hebron. Senior Israeli politicians have ratcheted up calls for annexation of Hebron. Most recently Knesset Speaker Yuli Edelstein participated in a conference focused on the goal of establishing Israeli hegemony over Hebron. Advancing a plan for a new settlement industrial zone inside of the boundaries of the Kiryat Arba settlement, but in a location that is not contiguous with the built-up area of the settlement (expanding the footprint of the settlement on the ground). Advancing plans for a new settlement to be located above the historic Palestinian vegetable market in downtown Hebron. Approving a plan to build a new 31-unit settlement at the site of an Israeli army base in downtown Hebron. Creating and funding a new settler municipal body for the settlers living in small enclaves in downtown Hebron. The Israeli settlement watchdog NGO Kerem Navot discovered yet another case where the World Zionist Organization (WZO) provided a mortgage for an illegally built settlement structure, in this case a house in the Eli settlement, “owned” by a settler named Gilad Ach. Ach heads the radical Ad Kan organization which is known for infiltrating organizations that are working to end the occupation in order to undermine them. FMEP has repeatedly covered reports of evidence that the Settlement Division of the WZO (which is entirely funded by Israeli taxpayer money) engages breaks Israeli law in order to advance the settlement enterprise; this latest report continues to add to that body of evidence. In the case of Ach’s house in Eli, the WZO decided to issue the mortgage despite the fact that not a single structure in the Eli settlement is legal. Though the Eli settlement has received Israeli government approval, a “Master Plan” – which officially zones land for distinct purposes (residential, commercial, public) – has never been issued. Meaning, Ach’s house lacks a valid building permit. Despite the WZO’s criminal track record, the Israeli government is actively transferring more land in the West Bank over to the WZO for management. A government-backed bill to expedite the transfer more land to the WZO was recently stalled in the Knesset by the Israeli Attorney General, who assured the Knesset that the legislation was unnecessary because the transfer was already proceeding at the administrative level. As a reminder, the WZO’s Settlement Division was created by the Israeli government in 1968 and is funded entirely by Israeli taxpayers. Its mandate is to manage West Bank land expropriated by Israel, in order to facilitate the settlement of Israeli Jews in the occupied territories. To make this possible, the Israeli government has allocated approximately 60% of all “state land” in the West Bank to the WZO’s Settlement Division [over the past 50 years Israel has declared huge areas of the West Bank to be “state land,” including more than 40% of Area C, where most of the settlements are located]. Amnesty International (AI) published a new report – entitled “Destination: Occupation” – outlining how AirBnb, Booking.com, TripAdvisor, and Expedia (the largest global online booking and travel companies) are fueling human rights violations and the expansion of settlements through their decision to list rental properties located in Israeli settlements in the occupied West Bank and East Jerusalem. Despite political interference, on January 24th the Israeli Shin Bet announced that it had filed an indictment charging a settler with manslaughter, for the 2018 murder of Aisha al-Rabih. Rabih, a Palestinian mother living in the West Bank, was killed by a large rock thrown through the windshield of a car she was riding in with her family. The settler charged with the crime – based on DNA evidence – is a 16-year-old from the Rehelim settlement, where he attended yeshiva (Jewish religious school). Following the indictment, violently skirmishes erupted in hotspots in the West Bank known for the activities of radical settlers. On January 26th, settlers living in the Adei Ad outpost reportedly approached the Palestinian village of al-Mughayir, resulting in clashes during which the settlers are believed to have shot and killed Hamdi Nassan. The murder resulted in widespread international attention and concern, though Israel has reportedly not yet questioned settlers who were present at the crime scene. On January 26th, video cameras caught settlers vandalizing property in Turmusaya – located within sight of the Adei Ad outpost in the Shiloh Valley. Clashes between IDF forces and Palestinians also erupted on January 27th at the entrance of Turmusaya. That morning, Israeli forces erected a new checkpoint along the road leading to Turmusaya in anticipation of a funeral parade for Hamdi Nassan, killed by settlers in al-Mughayir the day before. During the clashes, Israeli forces reportedly fired live ammunition, tear gas, and stun grenades at the Palestinians. As a reminder, the illegal Adei Ad outpost is built on land that has historically belonged to Turmusaya. Yesh Din published a lengthy report chronicling how Adei Ad outpost settlers use violence as a means of land confiscation. Rewarding their criminality, in August 2018 the Israeli government approved a plan to included the Adei Ad outpost within the expanded borders of the Amichai settlement, the first new government-backed settlement in 25 years. The massive expansion of the Amichai settlement and the transformation of Adei Ad into a brand new settlement, if implemented, will be a significant step towards creating an uninterrupted corridor of settlements connecting sovereign Israel to the Ariel settlement, through the isolated Shiloh Valley settlements, all the way to the Jordan Valley. In so doing, It will completely bisect the northern part of the West Bank. Disgraced American actress Roseanne Barr was shepherded on a tour of Israeli settlements and settler installations by Rabbi Shmuley Boteach, a prominent American activist and settlement supporter. The two were accompanied by fawning senior Israeli politicians, including Culture and Sports Minister Miri Regev. Barr’s trip was funded by Rabbi Boteach’s group, World Values Network. Barr’s tour – which she said was aimed at pushing back against the growing calls to boycott Israel and/or its settlements – included several public speaking engagements, a visit to the West Bank settlement of Peduel (a history of the Peduel settlement can be found here), a visit to the Muslim Quarter of the Old City to visit a home owned by the radical settler group Ateret Cohanim. Barr was famously fired from her eponymous tv show after she posted racist public comments posted to Twitter. Commenting on her firing to an Israeli audience, Barr joked that she was “BDSed by ABC,” suggesting that the real reason she was fired was Hollywood’s intolerance for her support for Trump (who is widely loved in Israel) and her Zionism.